I remember one more rikishi who lost to a yokozuna (I don't remember which Y it was) but was voted into the top 3 spirited rikishis: Ura. 2 matches are still missing: Nishikigi vs Kotoyuki Amakaze vs Chiyoshoma Will they be uploaded at some point? I need all Makuuchi bouts before I start watching them. Or did two rikishi in the two matches go kyujo? That would explain why there's no video for both matches. Good thing all Juryo bouts are there. Thanks to whoever uploaded them. Positive stuff for me this basho: - A great Yoshikaze, I always liked him. Should be safe for getting the shukun-sho - Kotoshogiku 10 wins. 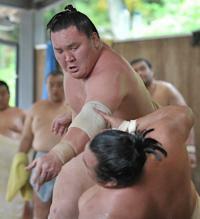 Of course, if Hakuho and Harumafuji weren't kyujo he probably would have less wins. - Aoiyama makekoshi. I simply don't like his face and his sumo. - Same goes for Chiyomaru in Juryo. Usually only wins after pulling the opponent down. And he looks like he doesn't like keiko very much. Will be at the bottom of Juryo next time so another basho for me without having to see him! - Sadanofuji now has his first win. - Tokitenku and Sokokurai now safe to stay in Makuuchi for the next basho. I somehow like both. And always funny to see Tenku trying Ketaguri and totally misses the kick. - Shohozan back in Makuuchi next time. I hope he'll be wearing the golden mawashi again. Same here about Chiyomaru. Always trying the same thing. Happy about every bout he loses. But Chiyotairyu can do better. He wasn't doing bad when he was in the higher maegashira ranks with a more aggressive oshi style. But alas he gets injured very often. Sadanoumi (I like him since he was in Juryo) and Tokushoryu are doing surprisingly well up there, but it'll still be hard to get kachi koshi for both of them. Even a 7-8 wouldn't be that bad. I doubt Kakuryu will make it to Yokozuna. Technique prize for Chiyotairyu? He had a great basho, but he mostly won via tsuki/oshi sumo. Not really much else. But maybe I'm wrong about kanto sho / gino sho. Maybe it's just me but when I think of technical sumo I rather think of nage, hineri, leg-techniques like Sotogake and so on. But I'm sure there's something I just don't understand yet. only 3 promotions? Then Tanzo might be still in Juryo next Basho (I'm hoping for him), as Kitaharima and Takanoyama were clearer demotions than him (next to Baruto's intai). I for myself hope he will get demoted. It would be very interesting (at least for me) to see how he's doing below the Ozeki ranks. I'm happy for Kizenryu. Saved himself with a nice kekaeshi. Now I hope that Tanzo gets one more win. I like their style of sumo and I think (and hope) they should be able to keep themselves in Juryo for a while. Ms50w Ryuden (10.11.1990) kyujo Sd90w Keitenkai (10.3.1990) kyujo Ms9w Dewahayate (31.1.1989) 3-3 Sd71e Ebisumaru (31.5.1991) 1-5 Sd52e Asanotosa (10.11.1981) 3-3 Sd60e Daishokai (25.12.1990) 3-3 Sd20w Kotokuzan (11.3.1994) 4-2 Oh, I didn't know someone else has Dewahayate as adoptee. But he's indeed very interesting and promising. And about Ryuden and Keitenkai, it's really unlucky, both get Sekitori and get injured in the first basho in Juryo... Does someone know something about Kotokuzan? He's japanese but his real name is very unjapanese. :-D Maybe it's just a name but maybe there's some story about him? Maybe I'll also take some rikishis from Jonokuchi soon. Apart from Ryuden all of them I started watching in Sandanme. But I really should take time watching Jonidan and Jonokuchi. I'm always very excited about the bouts in Makushita and Sandanme. I found it, downloaded it, then started the file "media player classic" (is that the right thing?) and this error here appears: And it still doesn't work with VLC. How can I watch it? it's a .rm-file. Doesn't seem to work with wmp or VLC player.